White tigers are neither albino nor a separate endangered species, and many consider the breeding of white tigers cruel because the results are often disastrous. White tigers have pale fur, blue eyes (which are often crossed), and black stripes. They are not albino, nor are they an endangered subspecies. Rather, they are Bengal tigers that have received a recessive gene for the white coat from each of their parents. Because two such genes are required to produce white fur, with natural breeding, a white tiger would be born only once in approximately 10,000 births. White tigers are rare in the wild. Over the past century, just 12 have been spotted throughout India. There are a large number of white tigers in zoos, but the continued breeding of white tigers is highly controversial for a number of reasons. Exotic animals represent a multimillion-dollar industry, and white tigers are exploited by zoos, circuses, and individuals because their popularity makes them financially lucrative. Zoos and animal-based shows can increase their attendance if they have unusual animals, and individuals acquire them as status-symbol pets. Most individual adopters of big cats have no idea how to care for them properly. Playful little cubs grow up to be enormous, ravenous, unmanageable animals that do not make good pets. They are noisy, volatile, and require 15-20 pounds of raw meat each day. Individuals who buy big cats usually find that they cannot handle them when they grow up, so they either arrange to have them put down or sell them to roadside zoos, where their lives are bleak and miserable. Maintaining captive populations of anomalous animals sends a message that it is alright to breed them for no other purpose than to own them as exotic pets or show them for profit. Continuing to breed white tigers serves no conservation purpose because their survival prospects in the wild are slim. Orange tigers have natural camouflage in the wild. It is not as easy to sneak up on prey with a snowy white coat. Some people mistakenly believe that white tigers originated in Siberia, where the white coat would provide the advantage of camouflage in the snow, but this is not true. Because white tigers are actually Bengal tigers, they live on the Indian subcontinent where white colouring would be a disadvantage. There is some evidence that having one recessive gene for the white coat may be beneficial. Orange tigers with just one white-coat gene tend to grow faster and reach a larger size, which explains why such a gene would persist in the gene pool. But when two white-coat genes are present, it creates many problems for the tiger. Many of the white tigers in captivity can trace their origins to a white cub named Mohan, whose mother and siblings were shot by a hunter. Thus, most white tigers are related to one another. To maintain a population of white tigers, facilities that keep them must inbreed close relatives, which increases the likelihood of health problems and cognitive deficits. In addition to a high rate of still births, many white tigers suffer severe physical and mental impairments and deformities. Common birth defects include immune deficiency, cleft palate, abnormal kidneys, and scoliosis of the spine. Because of the high likelihood of problems, many tiger cubs are produced and disposed of in order to get a few that are suitable for display. To learn more about the problems associated with breeding white tigers, visit Big Cat Rescue. To read about threats to the continued existence of wild tigers, see Why Tigers Are Endangered. Big Cat Rescue. (n.d.). The White Tiger Fraud.” BigCatRescue.org. Hartwell, Sarah. (n.d.). 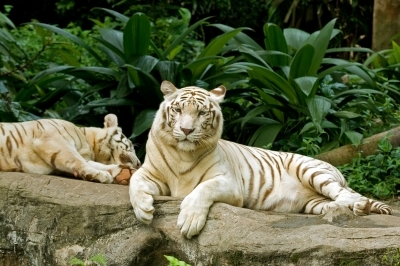 “White Tigers – Inbreeding Depression and Genetic Anomalies.” MessyBeast.com. Indian Tiger Welfare Society. (2009). “White Tigers.” IndianTiger.org.